No, It’s not April 1st! When I read this article it had all the hallmarks of a classic April Fools joke, but no – it turns out that McCallum Bagpipes are supplying the Sultan of Oman’s Royal Guard with flexible blowsticks for their camel-mounted pipers! Apparently it’s difficult to ride a camel and play the bagpipes at the same time – the ride is bumpy and teeth get knocked out. When McCallum Bagpipes’ Omani distributor passed the news of this problem to the good people at McCallum, the company responded with their characteristic ingenuity and now mounted pipers the world over can breathe a sigh of relief. I heard an interesting pairing of tunes on this week’s edition of the BBC Radio show Pipeline. Gary West’s guest was Glenn Brown of Ontario, and he gave a fine performance of The Big Spree. On the same show Gary featured a tune called The Gathering of the MacDonalds of Clanranald. This was performed by Decker Forrest on a reproduction of a Donald MacDonald chanter, which would mean that the instrument should sound like those from the early 1800’s. The differences between the tone of the modern instrument and the “old” one were quite marked. To my ears, I preferred the sound of the older instrument, but maybe that’s just my enthusiasm for archaia speaking. In any case, there is a movement within piping (similar to that in classical music), toward playing tunes on period instruments. I know the purists on either side will argue that their sound is the “correct” one – either true to the original, or allowing the evolution of the instrument to speak for itself – but I’m personally happy to listen to both. Glenn Brown and Decker Forrest both gave beautiful performances of two great tunes, and I’m glad to live in times when I can hear both side by side. I read a news story today adding some information to my earlier post about the new McCallum McCÂ² solo bagpipe chanter. The August 10th online edition of the Campbeltown Courier newspaper has an article about the new chanter, and includes interview material from Stuart McCallum, founder of McCallum Bagpipes. …Before he left the competition the orders for the new chanter were coming in thick and fast from fellow solo pipers…. I may have to get my order in soon! An interesting new business venture caught my eye last week. World-renowned piper Willie McCallum announced the launch of a new pipe chanter, the McCallum McCÂ², designed with soloists in mind. The development of the cleverly-named chanter is the result of a collaboration between Mr McCallum and the highly successful pipe makers McCallum Bagpipes, of Kilmarnock, Scotland. You can read about the chanter on Willie’s new website. I’m not sure if there is a direct family relationship between the two parties, but either way it seems like a match made in heaven. Willie took the new chanter out on a very public (and potentially risky) road-test the week of the World Pipe Band Championships, where he played it unannounced at the Lochaber Gathering. Willie cleaned up that day, winning all the events he competed in – this surely doesn’t hurt potential sales! I have played McCallum bagpipes since I started piping (admittedly not that long ago), and I have always been impressed both with Stuart McCallum’s bagpipes and his customer service. His chanters have become the benchmark for pipebands around the world (both bands I have played in so far used them), and it is interesting to see him expand so positively into the solo arena. I wish both sets of McCallums success in this new venture, and you know where I’ll be shopping when I need a new solo chanter! …thanks for the article which is good and does not misrepresent the product at all. The new chanter is quieter and slightly lower pitched than the previous model which was mainly designed for the pipe band market. As you say it is designed for the solo market. The main characteristics we tried to achieve were stability, good harmonic and volume balance with the drones, reedability, clarity of notes and embellishments, projection without too much volume. The stability of the piobaireachd high G was a major development priority. Hope this information is helpful. Let me know if I can provide any further. Thank you Willie – I think this is going to be a popular chanter. What connections are there between Finland and Scotland? Well, here are a few: they each have hard-to-learn languages (Finnish and Scots Gaelic are right up there with Navajo), they are both cold quite a bit of the time, and, of course, both countries have great music. Since I am one quarter Finnish (on my Father’s side), I always pay attention to things Suomi. For example, the other day I found myself behind a car in downtown Salt Lake City with a bumper sticker instructing me to “Honk If You’re Finnish”. I honked; the occupant paused, then waved. A few days ago I received a private message from a member of the Piping Forums of which I am a member. Mikko, from Oulo, had written to me asking if I were Finnish. He is the only Great Highland Bagpiper in his town, which is “200km south of the Arctic Circle”. Turns out, if he were to move south, to Helsinki, he would have company. Yesterday I found my way to the website of the Helsinki Pipes and Drums. They are the “oldest, finest and only Pipe Band in Finland”, and they compete in Denmark and amongst the Scandinavian countries. They’ve even been to the US. I think it’s a good sign when a notoriously shy people will play the loudest acoustic instrument there is. My kids were watching the show “Make Way for Noddy” yesterday. The title was “Noddy and the Magic Bagpipes”, which was enough to catch my interest. In the episode, this pre-school icon is so impressed by the sound of his friend Big-Ears’ bagpipes he convinces Big-Ears to lend them to him. Big-Ears impresses upon Noddy the need for regular practice. Un-named consequences are hinted at if Noddy fails to comply. Predictably enough, Noddy’s first flush of enthusiasm wanes quickly as various distractions cause him to shelve the pipes for several days. Because of lack of practice, the set of pipes comes to life and runs around the neighborhood on its little drone legs, sneaking up on people and causing chaos. Moral of this story – follow through on your commitments, or suffer the consequences. When I came downstairs this morning, I checked my pipes were still in their case. They were, but I learned something today. 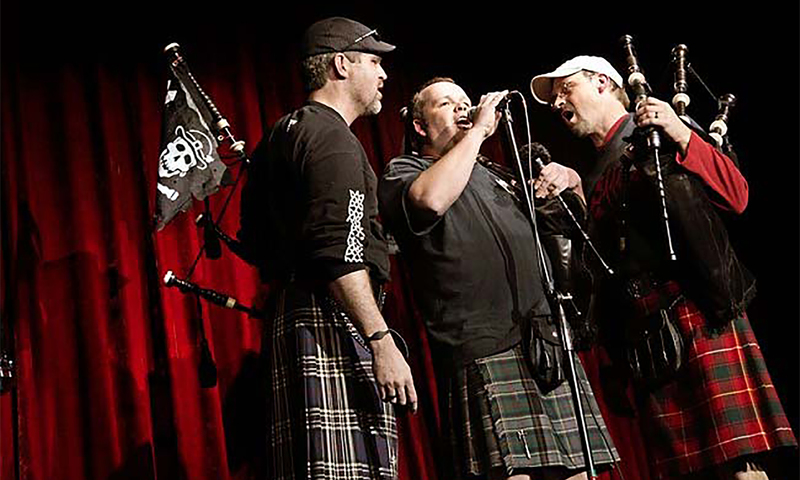 McCallum Bagpipes – a cool company! McCallum bagpipes – genuine top notch company!!!!!!! This just confirms what I have known all along about McCallum Bagpipes – that they are the best company around. As I write, the list of names of those who died in the terrorist attacks of 9-11-2001 is being read in Manhattan. The FDNY Pipeband has just finished playing Minstrel Boy. In the days and weeks that followed 9-11, the band played at funerals for their 343 comrades who died that awful morning – sometimes as many as 19 funerals in one day. The bagpipe is an instrument like no other. Ot one time classified an instrument of war, playing was punishable by death. Today, the public face of the pipes is all too often the lone piper playing Amazing Grace at funerals. I seem to have been to a lot of funerals in the last few months. People very close to me. I have played for some; others I have attended and observed silently. Throughout all of this I have become more and more aware of the bagpipes’ role as a ceremonial instrument. I feel the accumulated weight of the people who have died for playing, while playing and then been played to their graves by the bagpipes. My pipes seem to have acquired a have a power I can feel when I pick them up. We live in sad times – human life seems increasingly cheap all over the world. But despite the sadness, both personal and social, there is no denying the joy playing the pipes brings to me and my listeners. I don’t even play very well, but I have received the compliments of so many people for playing. At highland games, in parks where I’ve practiced, on the street where I live, people shake my hand and thank me for enriching their lives. It’s the pipes they’re thanking – I’m just the messenger. It may be an inconsequential act, set against all our problems, but sounding a note of cheer and encouragement is something I can do. I remember my family and friends who have gone before me, and I hope my piping will continue to brighten the lives of those with whom I still share this life.